Expert tips for the last piece in the paperless puzzle The Bluebeam Guidebook offers comprehensive coverage of the industry's leading PDF tool to help AEC professionals adopt a more efficient digital workflow. With desktop, mobile, and server-based products, Bluebeam makes collaboration and document coordination seamless, and provides a perfect complement to BIM software. This book shows you how to push the boundaries and discover the software's true capabilities. Written expressly for working AEC professionals, this book offers tips, tricks, and ideas that cater to industry-specific needs. Expert instruction and step-by-step guidance helps you get started quickly, and case studies feature users from firms such as Kiewit, Populus, Sundt Construction, and more to show you how Bluebeam is quickly becoming a critical component of design and construction. Master the industry's leading PDF software and alternative to Adobe AcrobatCreate, edit, and markup documents in a way that suits the architecture and engineering workflowLearn how major AEC firms have transitioned seamlessly to digital workflowsIntegrate Bluebeam into estimating, quality control, field applications, and more The days of file boxes and paper reams are quickly coming to a close. The transition to paperless has been a boon for the AEC industry, in which collaboration and document sharing is central to getting the job done. BIM has revolutionized the design process, and Bluebeam offers that same level of functional innovation for the document side of every project. 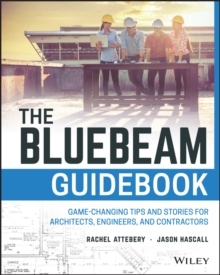 For AEC professionals seeking a better way to get things done, The Bluebeam Guidebook is your ultimate guide to everything Bluebeam can do for you.